Custom fireplace designs in GFRC by Stromberg come in a wide variety of choices; they offer the largest selection of fireplaces anywhere. Stromberg has 30 years of experience working with glass fiber reinforced concrete (GFRC) and can provide you with fireplace designs from modern to classic. Bring your vision to Stromberg; they’ll create a custom fireplace, mantel or surround in GFRC that will match your needs. They’ve designed custom fireplaces for homes, restaurants, hotels and casinos. GFRC is a unique and versatile product because it uses glass fibers for reinforcement instead of steel. This one feature makes it much lighter in weight and therefore an excellent choice for your custom fireplace, surround or mantel. GFRC is also non-combustible and rust resistant, so there’s no need to cover it with a protective coating of concrete. Stromberg pioneered the use of GFRC, which is a combination of cement, glass fibers, aggregates and polymers. Glass fiber reinforced concrete is so adaptable that it can be crafted into just about any fireplace design idea you have. Your fireplace can have the look of authentic terra cotta or limestone, or simply be painted in the color that matches your room décor. Stromberg uses molds to craft your fireplace from GFRC, so any design, intricate or simple, that you can imagine is possible. GFRC is a non-combustible material and has been shown in lab tests to withstand high temperatures. It can also stand up to outside weather conditions without cracking; so it’s a good choice for an outdoor gas fireplace. Stromberg has built custom fireplaces in GFRC for churches, government buildings and the hospitality industry. In each of these applications, their work has added that special touch needed to create a one-of-a-kind atmosphere. 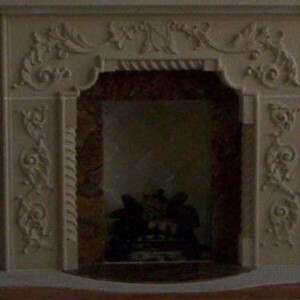 GFRC fireplaces and surrounds are available in a variety of colors, finishes and textures. Glass fiber reinforced concrete is very durable and long lasting. GFRC can be made into a wide variety of designs. Glass fiber reinforced concrete is made with minerals and so is an earth-friendly product. The professionals at Stromberg Architectural Products will work with you to develop your idea of the perfect custom fireplace to life. Stromberg is here to help with CAD details, design assistance and specifications. Contact the architects and drafting professionals today at (903) 454-0904 for your free custom quote, or email them.